Fiber optics, both real and imagined, permeated zoe|juniper’s most recent multi-disciplinary installation at the Frye Arts Museum. 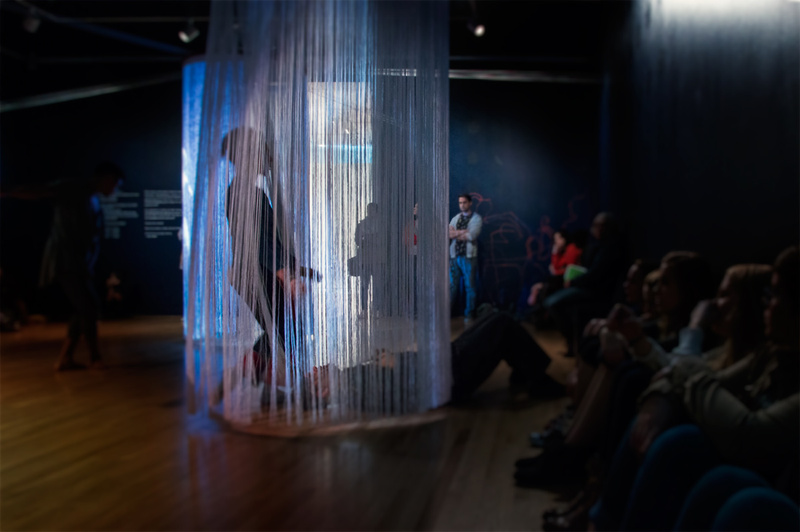 The company took over a room at the Frye for We were., a 6-hour long installation, as part of the museum’s 16-week Genius exhibit. The Genius exhibit aims to curate works from artists of different mediums that have received The Stranger’s Genius Award, in celebration of multi-disciplinary artistic collaborations throughout Seattle’s ever-changing political, social, cultural, and economic climates. We were. was performed on September 26, November 5 and 12, and will be performed again on December 3. The duo of choreographer Zoe Scofield and visual artist Juniper Shuey has created many works at the Frye, but this round was a retrospective of sorts. From the company’s description the work “is inspired by memory and the maps our brains build to house thought.” Clips of past works—some minute, some larger-than-life—were projected onto strings hung from the ceiling to make a cylindrical shape. The dancers, dressed in black and white (with Scofield in orange), improvised phrases from past works to music also previously used. Even the performers—Brittani Karhoff, Jim Kent, Erin McCarthy, Kim Lusk, and Alexander Pham—have all worked with the company before. Ultimately, the elements of the piece all sought to address the following points: “The process of remembering changes the experience being remembered. Can the act of remembering, layering the processes of recreating, make new experiences?” As with most works by the company, each question led to more questions without revealing a simple answer to the first one. The durational format allowed zoe|juniper to explore different ideas of memory on multiple levels. The dancers performed sections up to an hour long, with short breaks in between. In one section, the dancers improvised based on an academic, adagio-like phrase, complete with prolonged arabesques and sustained weight shifts. The effect was like neurons transmitting information in the brain or passing signals through synaptic connections. 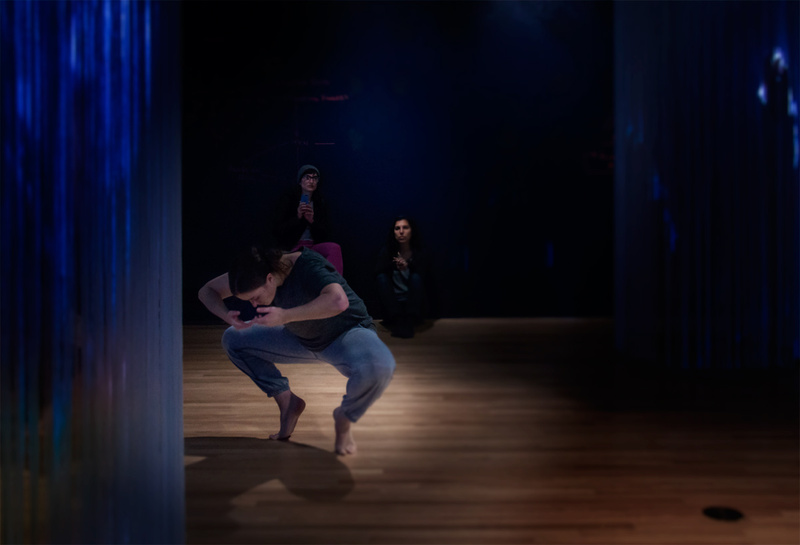 The dancers copied one another’s movements at certain points and then proceeded to continue with their own sequence—little groupings of similar ideas emerged here and there only to continue on individual trains of thoughts. In another section, Scofield literally exercised her dancers’ muscle memory by teaching them a polyrhythmic phrase, complete with claps and slaps on different body parts, that the dancers had to remember on the spot (given that all the dancers had worked with Scofield before, it became clear that some of them may have learned it before and still had muscle memory of the phrase). She then gave a score with which the dancers could play, scrambling the phrase and interspersing their own interpretations where they saw fit. The result was similar to the previous section, if not more poignant. Playful rhythms emerged here and there, and because of the variety of dynamics—a counterpoint between sustained meters and syncopated cadences—relationships also grew more distinct. It was almost like watching a metaphor for life itself: everyone progressed on their own paths, allowing both convergences and divergences to happen, and hellos and goodbyes within relationships to come and go. 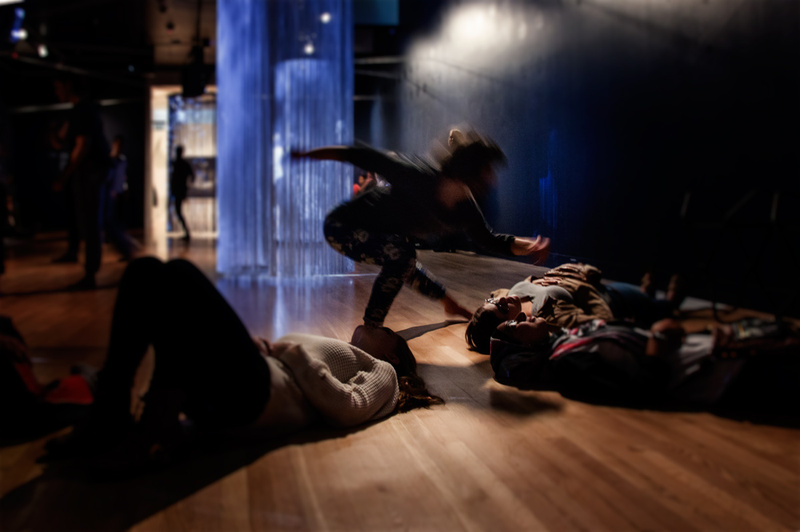 A highlight came at the end of the durational performance when the dancers, after going about in their own pathways, proceeded to form a line and become still. Some were on the ground, some were standing, yet their evocative forms all complemented each other. In We were. the durational format was both a blessing and a curse. 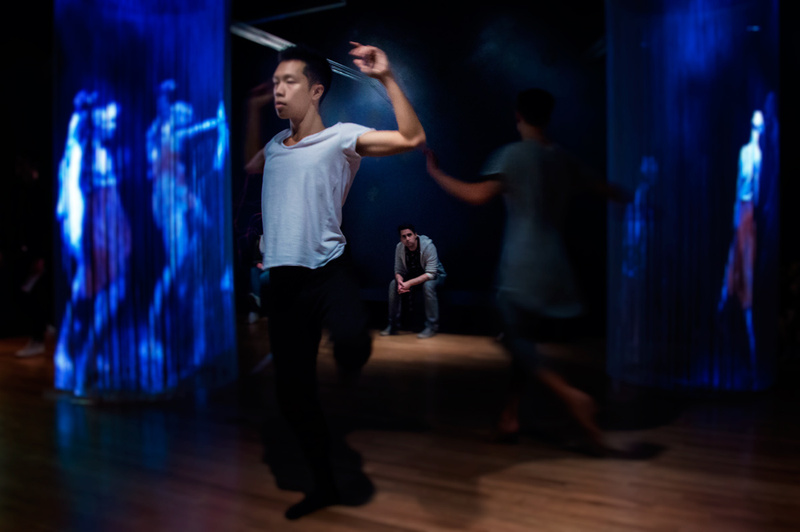 By the end of the 6-hour run, it was evident that the dancers had been there a while, so focus and intention sometimes faltered, which took the viewers out of the world the performers had tirelessly created. On the other hand, the length of it all allowed time and space for the audience to reflect on memories and even project perspectives or experiences. A playful chase between the dancers may remind one of “that time I did xyz,” or a tender touch may bring to mind an image seen on the way to the museum. Even watching clips of past zoe|juniper works, layered upon one another on the strings may bring back a state of mind of past viewings, only to realize how much that perspective have changed since then. Memory is an abstract concept, yet We were. manages to provide space for viewers to break it apart, dissect it, and create new experiences just by the simple acts of watching and remembering. For more information on the company, visit zoe|juniper’s website. More information on the Genius exhibit running until January 10 can be found at fryemuseum.org.